This Thanksgiving, you can help make sure that local families have what they need for a proper family dinner. Join Solution FM (and our sister-station, WHCF) on Friday, November 1st at Cross Insurance Center in Bangor from 4pm until 7:30pm. 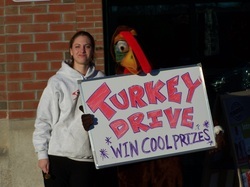 Donate a turkey for local families in need and you get to "toss a turkey" and win great prizes! Also, the class/youth group that donates the most turkeys will win a Pizza Party from PAPA JOHNS PIZZA and Free CDs! If you have any questions about the Turkey Toss or about how to try and win the party, please contact Tim Collinsfor details at tim@solutionfm.com or call 207-947-2751.